How many of our teenagers and young adults take to tobacco smoking? What are the causes of tobacco smoking in young adults and teenagers? Nicotine is the highly addictive substance available in tobacco. It grabs on and takes hold and young adults are as susceptible as anyone, if not more susceptible. Young adults and teenagers do not really have the foresight to realise just how dangerous smoking tobacco smoking can be to living a full and healthy life. When you are young, you take your health for granted and forget that all the choices you make are likely to come back and bite as you get older. A new report has been released by the Surgeon General Regina M Benjamin about this very subject and with the approach of 'No smoking' Day in the UK, there is a focus on helping people quit smoking tobacco. In the US, about 4000 young people under the age of 18 take up tobacco smoking each and every day! That is an atrocious number! In the UK, about 340,000 young people under the age of 16 take up tobacco smoking for the first time each year. Another atrocious number, considering that we are a very small fraction of the population of the US. In the UK, surprisingly more females than males are likely to be considered regular smokers. I was quite astonished by that fact as i always felt females had a better handle on the seriousness of the issue but well, maybe it is just my old-fashioned way of thinking. Another crazy fact is that for every tobacco smoker that dies (1200 a DAY! ), about two of our young adults are available to take their spot which means that in the US at least, tobacco users may still be increasing. The problem is that is is harder for young people to quit smoking tobacco. Tobacco can be used in a variety of different ways and they are all dangerous. There is smokeless tobacco like 'chew and snuff', pipe smoking, cigars, wrapping tobacco in tendu leaves and the more regular cigarette smoking. A major cause of teen smoking is the present of smokers in the home. 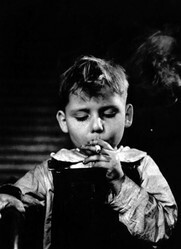 Children who live with parents or siblings that smoke are three time more likely to become smokers themselves. This is not unreasonable - if you are brought up to consider tobacco smoking normal then of course you will turn to it as soon as you can. In the UK, 23000 young people start smoking by the time they are 15 years old as a result of smoking in the home. Another huge factor that causes tobacco use in young people is the underhand marketing methods that the tobacco industry uses to attract new customers. Here, in the UK, there are attempts to prevent the advertising of products by the tobacco industry - even the packaging is kept as plain as possible and the warnings continue to increase on the packs (as well as the Taxes). However, there is more work to be done to prevent any media messages getting through that tobacco smoking and its use is in any way cool. In the US, cigarettes that are made to appeal to younger customers are smoother and milder in taste. The tobacco industry even puts fruit flavoring and other kid friendly flavors in many of their cigars! This is because they cannot flavor cigarettes! So now, there are cigarette sized flavored cigars available for sale! Even the packaging is made to appeal to younger customers. The Media also has a huge part to play in normalising the use of cigarettes. Less and less movies actually show celebrities participating in the use of tobacco but there is still enough to impact our young people who look up to movie stars and long to be like them. On the internet, however there is definitely more scope for the tobacco industry to promote their wares. Videos, games, contests, coupons are things teenagers are attracted to, the industry can be found lurking in these places advertising subtly their wares to the naive young adults. These young people when hooked then become their best marketing tool as they are likely to share the 'joys' of tobacco to their friends in places like facebook. Magazines are another way to reach new customers. Tobacco can not be advertised on TV or on billboards but they can be promoted to adults in magazines. Young adults read these magazines and slowly but surely the marketing messages seep in. Alcohol and Drug Use - Unfortunately, if a young adult is given to excesses of alcohol or even small regular amounts then he or she is likely to become a smoker as well. Did you know nicotine is as addictive as heroin? When a young person is involved in taking anything that could reduce their resistance then the chances of starting a nicotine habit are increased. Drugs and alcohol fall within this category. Learn how the use of sugar impacts your ability to stop smoking and what to do about. Make it easier to quit smoking.